Hearing loss affects millions of Americans, putting a strain on relationships, affecting cognitive abilities, and interfering with job performance. By the age of 65, around half of all seniors will have hearing loss, so here are a few facts about hearing loss you should know. To understand hearing loss, it’s important know how we hear. First, sounds enter our ears as sound waves, and hit the eardrum. 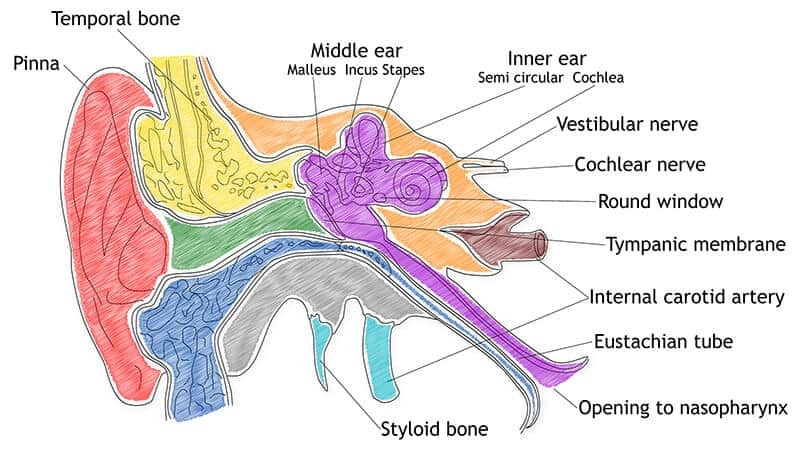 This is the middle ear, and it transfers these vibrations to the inner ear using three tiny bones. There the small hair cells, known as cilia, pick up on the vibrations, turn them into electrical currents, and send them up the neural pathway to the brain for processing. Hearing loss can be the result of injury, illness, disease, certain medications, noise exposure, and age. It can affect any part of the hearing process, from the outer or middle ear to the hair cells in the inner ear, or even the parts of the brain that are responsible for hearing. There are three main types of hearing loss, and a hearing test at Paragon Hearing can help you determine what kind of hearing loss you have. Sensorineural hearing loss is the most common kind of hearing loss and is caused by damage to the cells of the inner ear or the neural pathway. When these cells are damaged or destroyed, sound waves never reach the brain, so you can’t detect the sounds around you. This kind of hearing loss is most commonly caused by aging, or by exposure to dangerously loud noises. To protect yourself against sensorineural hearing loss, always wear ear protection in loud places. The good news is that sensorineural hearing loss can be easily treated with a hearing device. Conductive hearing loss is a problem within the ear itself. It can be caused by a blockage of the ear canal, such as a build-up of ear wax or other debris. It can also be the result of an injury that damages the small bones in the middle ear, stopping sounds from reaching the inner ear or the brain. Conductive hearing loss can sometimes be treated with medication or surgery. Mixed hearing loss is a combination of both sensorineural hearing loss and conductive hearing loss and is often treated with hearing aids. The early signs of hearing loss can be hard to detect. Since hearing loss is often gradual, our ears make small adjustments to the way we hear without our even realizing it. The first sounds to be affected are high frequency sounds, like the voices of women and children, or the birds chirping outside the window. Consonant sounds like S, F, SH, CH, H, TH, T, or K are lost. You’ll be asking people to repeat themselves, or find yourself straining to hear on the phone or in places with a lot of background noise. If you have hearing loss, it might be tempting to put off treatment for a while. After all, your hearing loss doesn’t seem so bad, and you don’t want to take the time or energy to invest in hearing aids. However, living with untreated hearing loss isn’t just about missing a few words or straining to understand conversations. Those who choose not to treat their hearing loss risk some serious long-term health consequences. When communication breaks down, as is the case with hearing loss, people are more likely to lack communication in family and friend relationships, and experience anxiety, social isolation, stress, and even depression. Studies have also shown a clear link between untreated hearing loss and rapid cognitive decline, such as difficulty concentrating, problems with memory, and significantly increased rates of dementia and Alzheimer’s Disease. Take your hearing loss seriously and seek treatment as soon as possible. Visit us today at Paragon Hearing for a hearing assessment and consultation.